Hiya. I got distracted by some new cookbooks but I'm back in brioche and rolling out the balls. Pretty excited about Louisa Weiss' Classic German Baking book, though, I'll tell you. I made a potato cake right on top of a rye bread crust. Why? Who knows. Those starchy Germans, right? 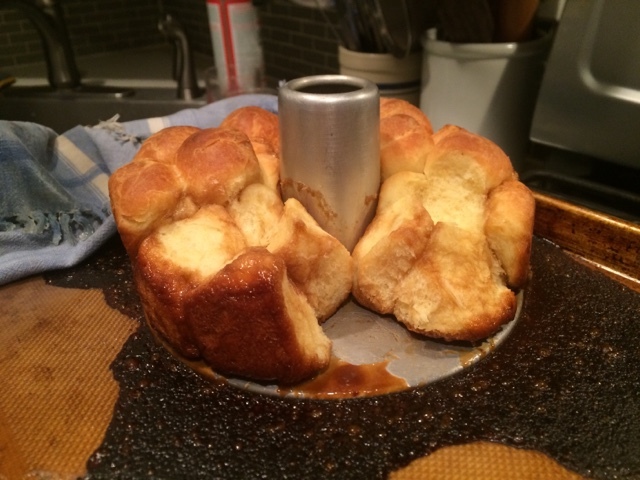 In Roseland, though, it was Monkey Bread week, and Monkey Bread is all about brioche dough. Side note: I am unable to make brioche without hearing Julia Child yodeling about BRI-oche in my head. Since I just read Alex Prud'homme's new French Chef book and showed Jeremy a bunch of French Chef episodes (one of which he found so inspiring that he immediately made Coq au Vin), this seems appropriate. 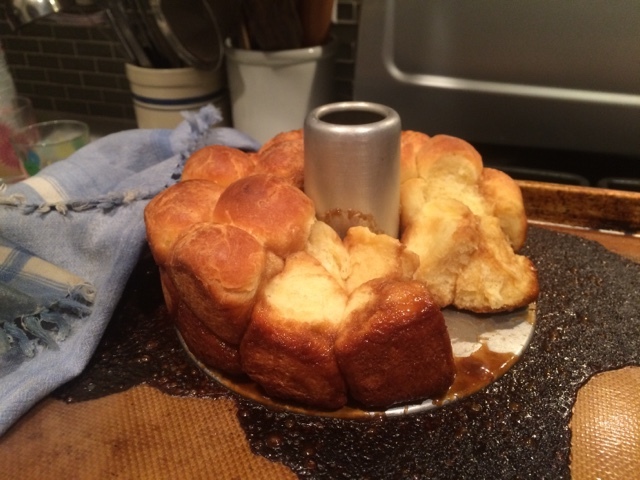 For this over the top Monkey Bread, I was supposed to make brioche, roll little balls of it around pieces of chocolate, drench it in caramel, bake, and cover with more caramel. I skipped the chocolate and the final caramel drench, because I genuinely prefer a simpler sweet bread. Not everyone agrees, however. I took this in to an office meeting and mentioned what it had been intended to look like, and saw colleagues' eyes glaze over with desire. So next time, I'll make it like that. In the meantime, it's pretty easy to make spectacular BRI-oche as long as you have a stand mixer. I wanted to make your version too, but made the over-the-top rendition. When I make it again for other people, I'll make the OTT one again. But if I ever make something just for myself, it'll be the "plain" version. Perfect color and crumb. Now I must google Julie yodeling about brioche. Absolutely beautiful and love the colors..